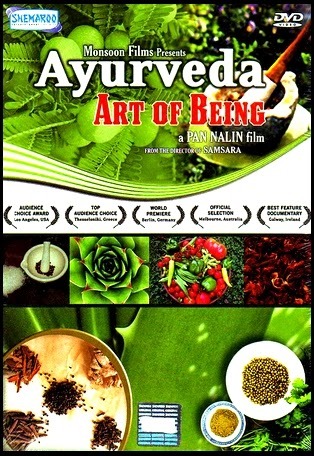 "﻿ Ayurveda: Art of Being "
Ayurveda : Art of Being, is a 2001 film which tries to voice the story of Ayurveda through exceptional Vaidyas (Ayurvedic Doctors), patients and experts. It travels nearly 15,000 kilometres through landscapes of exceptional beauty and geographical variety in India, Greece and USA. Its a very educative film about ayurvedic medicines. Some of the Vaidyas have revealed their secrets and open their home and clinics to us. Plant searching tribes took us into dark corner of jungle where a rare endangered plant still grows wild. Ancient Palm-leaf manuscripts locked away for 3 to 5 centuries were in front of us. Ancient 'Mud-Scanning' method of Diagnosis has been considered extinct and lost but our months long efforts managed to track down the last surviving place. A rarely seen lost science of Marma, vital points, and how it can kill or cure; was demonstrated on a goat for the first time revealing vital points which can paralyse. The director, Pan Nalin says about his pet project, "During the 3 long years while preparing the film I, myself have been surprised to discover how scientific Ayurveda is. I personally believe that our world of today, into a new millennium, is going to need natural arts of healing like it never did ever before. Spirituality and natural balances will play a vital role in governing our happiness in near future. No single film can do justice to the vast science of Ayurveda but For me the film is just a sharing, but the sharing that inspires, naturally." Pan Nalin has directed other award winning films like Samsara, The Valley of flowers etc..
Ayurveda is science of life and art of healing where body, mind and spirit are given equal importance. This voyage of thousands of miles across India and abroad takes you on a unique poetic journey where we encounter remarkable men of medicine or simply a villager who lives in harmony with nature. Hope is nature’s way of enabling us to survive so that we can discover nature itself. - Hundreds of patients participated in the film out of which 17 were covered in details. - Ten Internationally renowned Ayurveda doctors and experts are in the film.